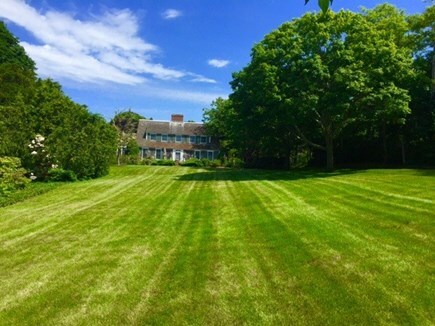 Rolling front lawn with patio, many beautiful trees and flowers. 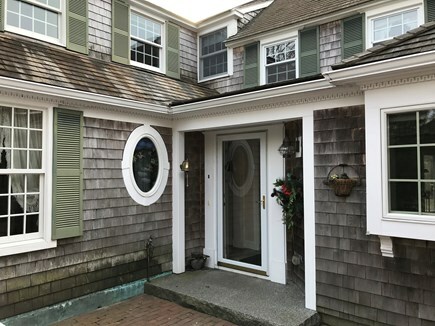 View Wychmere Harbor from the front door! Side view near the gated Koi pond and patio. 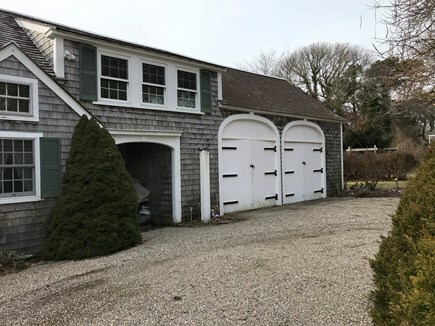 Garage with mew leading to the private yard abound with flowers. 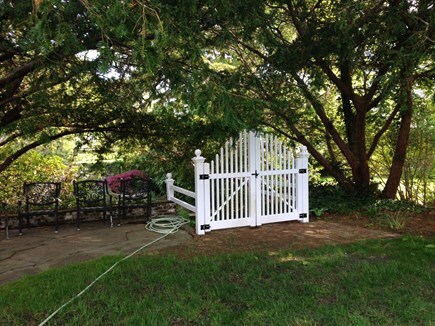 Gate opens to Koi Pond for your reading and relaxation. One of the three patios where everyone can gather. Large fireplace in inviting living room. 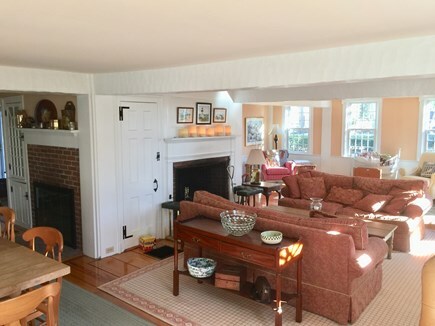 Living area with two fireplaces. Harbor view. Dining room with fireplace and table that seats twelve or more. Large reading area on first floor over looking harbor. Kitchen alcove with gas fireplace. 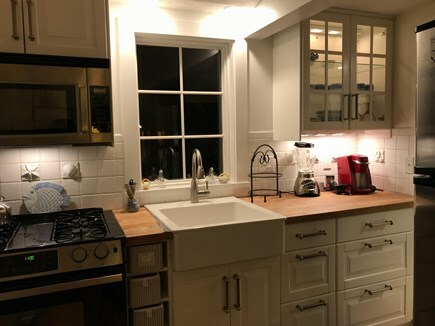 Second kitchen, the main house. Great for caterers convenience. 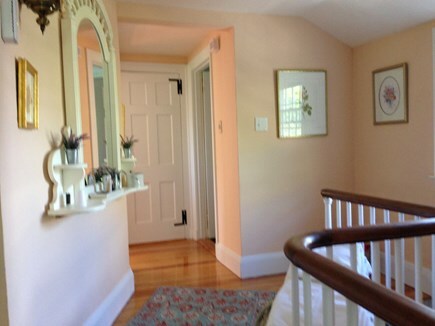 Hallway invites you to the upper three bedrooms. 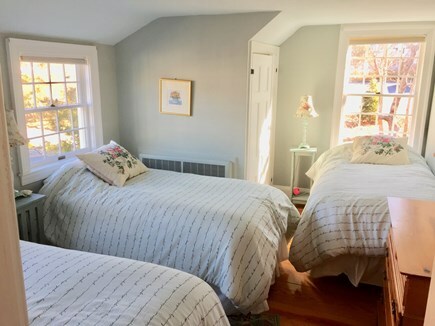 Upstairs bedroom with three twin beds. Master bedroom with fireplace, Lexington king bed and bath. 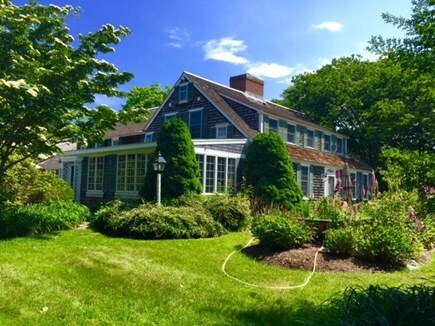 ''Stepping Stones,'' located across from Wychmere Harbor, is a magnificent, small estate on two acres offering a captivating setting adorned by huge shade trees, a sweeping emerald lawn plus a sunken garden with a Koi pond. The compound consists of a 7-bedroom main house (Stepping Stones) and a one bedroom cottage (Pebbles) 125 feet away. This rents with the house for an extra cost. It is not included with the price of the house. 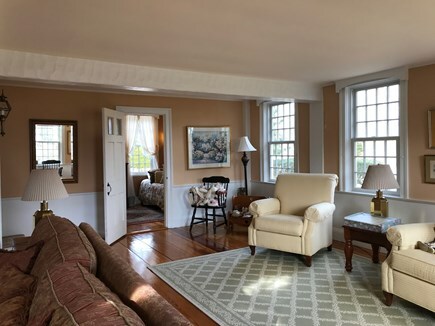 The main house, which is air conditioned with its 6/7 bedrooms and 4 1/2 baths, has been lovingly maintained and updated with a gourmet kitchen and butler's pantry waiting for your vacation enjoyment. 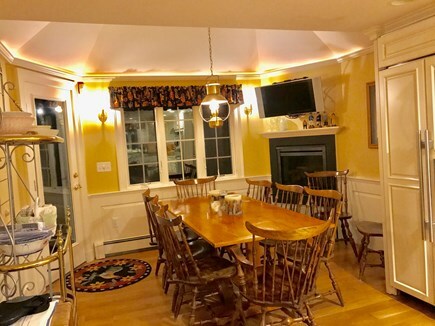 A distinctive post and beam ceiling surrounds two fireplaces that make the living and dining room a warm and welcoming place for you to truly relax. 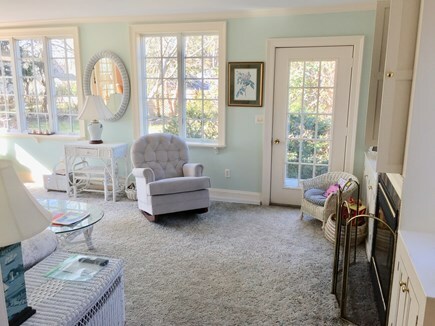 The first floor has an extra den/bedroom plus a large welcoming sun porch with a gas fireplace. 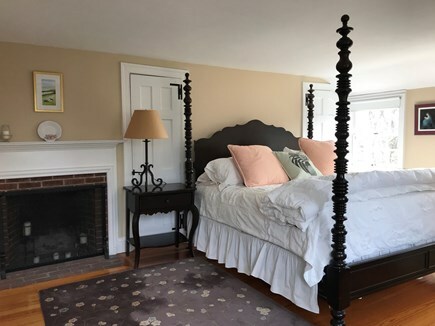 Two of the main house bedrooms are in separate quarters with their own elegant mini kitchen. Pebbles is 125 feet away from the main house. Just renovated, it has one king bedroom, a living room with a pull out sofa, a large living room with a gas fireplace, and a full kitchen. There is an outside shower and tub surrounded by a lovely garden. Pebbles does not come with the house it is an extra cost. Stepping Stones is across from Wychmere Harbor, the most photographed harbor on all of Cape Cod. In the morning, just meander down the driveway with your coffee for even more amazing views. Merkel Beach is two tenths of a mile from our house plus there are side ways that lead one half mile to town for shopping and excellent restaurants. Public transportation from our driveway can take you to Provincetown. You do not need a car. Additional availability info: June is available. This is a Sunday to Sunday vacation rental. Additional pricing info: $350. cleaning is not included. 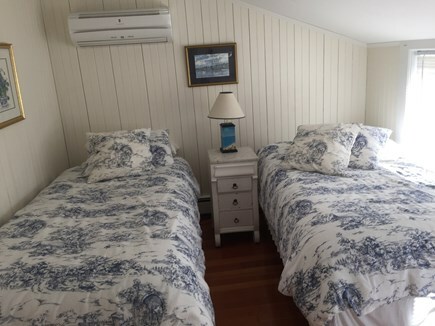 Linen and towels are included, State and local taxes of 12.45% will apply. The house has a first floor bedroom with a lavatory right off of it plus another full bath on the first floor. One small step to enter the main first floor living room. One step to enter home. 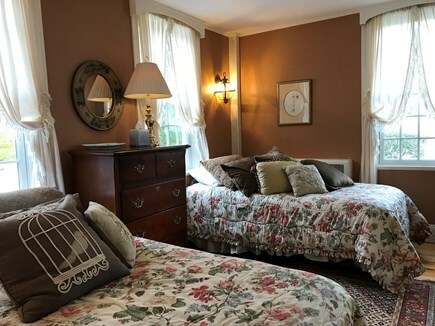 Stepping Stones is very conveniently located on Route 25 and set back from the road with a sweeping lawn surrounded with large specimen trees. 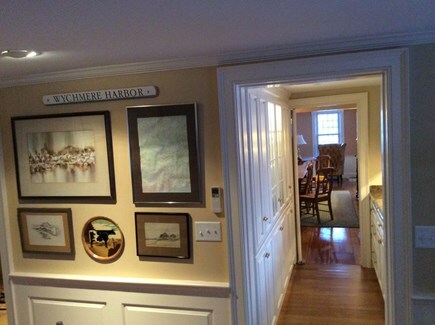 Across from it are unobstructed park views of the picturesque Wychmere Harbor. This charming home is very inviting with multiple indoor and outdoor spaces accommodating both intimate and larger groups. While there, we went from a group of four to a group of eight and then to one of sixteen, the latter being with cocktails and appetizers on an outside terrace and a seated lobster dinner at the long table in the dining room. We are happy that you enjoyed your stay at Stepping Stones and thank you for your most positive guest review. It is rewarding to know that when you entertained you took advantage of the little niceties that I like to supply for our guests. We welcome people having a good time and it sounds like you did enjoy! We hope that you have another opportunity to visit the Cape soon. 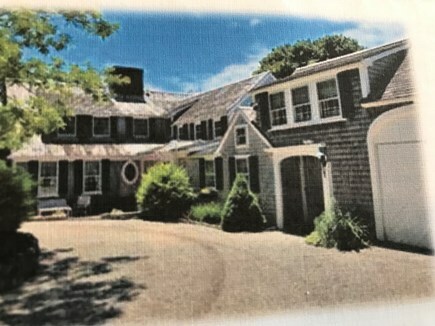 We rented Stepping Stones the last week of August 2018 for our 5th daughter's wedding. We sold our main house years ago where 3 of our daughters got married, nothing like a wedding at home. First, Marylynne and Dave went way our of their way to help us get this done. 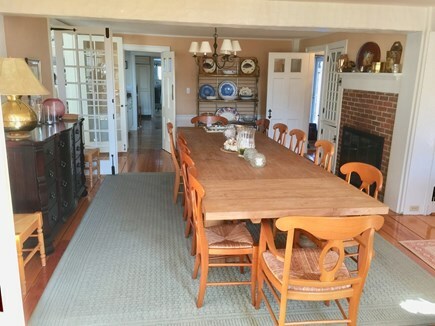 Next the house and yard are spectacular from the moment you walk in, what a great place to have a family reunion. We had the wedding tented in the front yard and the ceremony across the street overlooking Wychmere Harbor. 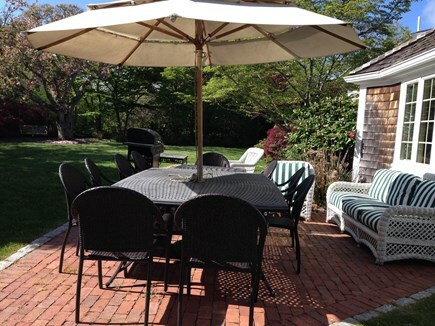 The night before the wedding we had the rehearsal lobster bake in side yard, again spectacular setting. It was nice to have the wedding at a home where it is more personal. The guests were overwhelmed with the setting and I know one person who will be getting married there. It was wonderful to meet your beautiful family and on top of that to have their wedding reception at our home and a few steps away the ceremony over looking Wychmere Harbor. Thank you for the concern and care you gave STEPPING STONES. We, also, appreciate the time and successful efforts to preserve the flowers and the lawn. It was nice to see everyone taking advantage of the space in the various sitting areas and enjoying our special spots with the small waterfall and Koi Pond. We wish you and your family the best of all that is good. This was our second stay at Stepping Stones. 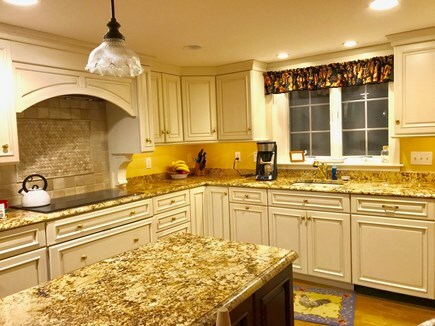 We love this home and the owners are fantastic. We love walking to town, going to the beach and spending late afternoons with all the kids playing on the front lawn. 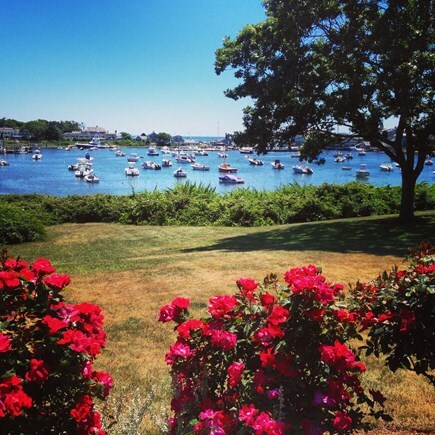 Wychmere Harbor is right across the street and we love watching the boats. Marylynn and Dave are great hosts. Always very responsive to any questions or if anything needs a fix. The owners were fantastic hosts! They were always making sure we had what we needed and had endless recommendations of places to dine and visit to make the most of our stay. Their house is fabulous and has beautiful grounds. We enjoyed barbecues on the patio and the use of bikes and boogie boards. Thank you! This home made our vacation and wedding gathering so special. Marylynne and Dave’s home was the perfect place for my family to reunite and make memories.The home is absolutely gorgeous and so welcoming.The grounds were spectacular and the pictures we got with my son (the groom) and his groomsmen were absolutely beautiful. Everything you need the house provided. Thank you for sharing your home with us. Thank you for your most positive review. We are always pleased when guests enjoy Stepping Stones and Pebbles. We work to keep it in good order and enjoy seeing people appreciate our efforts. You are the ideal family!! We wish the bride and groom, along with all involved, the best life has to offer!! Thank you for lovely review. You were excellent guests and welcome to come back at anytime. We look forward to your return in the fall. It is rewarding when our guests appreciate the extras that we put into having Stepping Stones a special place to remember a wonderful family event. 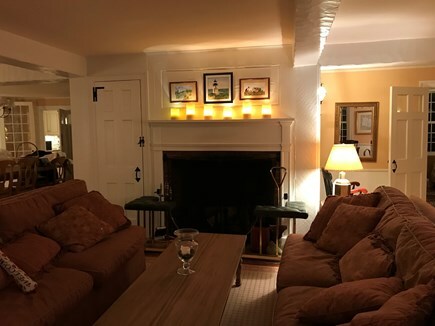 I stayed here for a long weekend for a 75th birthday celebration. The home was very clean and comfortably accommodated our 6 families. The grounds are beautiful with plenty of space for children to run and play. The town center is also very close. Overall it was a great stay! Thank you for taking the time to write your lovely review. We are always pleased when people enjoy Stepping Stones because we make every effort to make it special for our guests and to accommodate their individual needs. 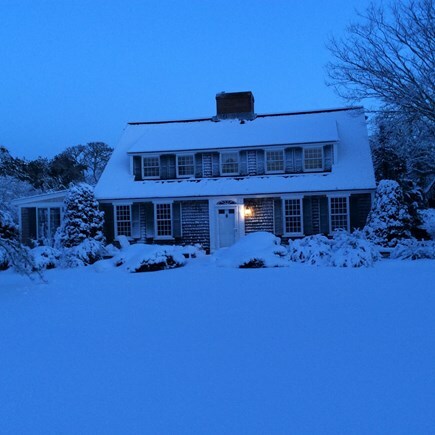 Gorgeous Home on the Cape! From the moment we walked into this beautiful home, we felt the stresses of our city life fall away. 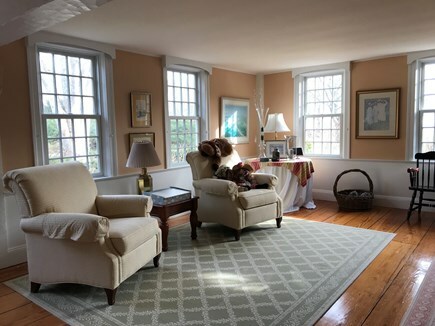 Although the house is large, it has a warmth and charm that made our family feel instantly at home and relaxed. The location was also AMAZING. We were within walking distance of the beach, restaurants and shops. We could not have asked for a better experience, thanks to this special home and its lovely owners!